Late last week the Smiths had some beautiful maternity portraits taken of Angie and the family. The photos were taken by their friend Tom Uchida of Uchida Photography. Below is one of their favorites. As you can see Tom is an AMAZING photographer. 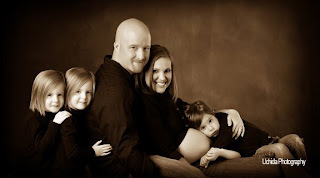 Please visit the Uchida website and click on Audrey Caroline Maternity to see more pictures of Angie, Todd and their sweet girls. You are going to LOVE them. Remember the Question About Charlotte?